I love discovering that someone is secretly a geek. I love it even more when that person also happens to be a chef. I had the recent pleasure of dining at Kirkland’s lowercase waterfront hotspot bin on the lake and I got to spend some time chatting with the newly-arrived chef Paul Hyman (disclosure: this was a hosted dinner). Chef Hyman’s Louisiana roots were evident in his passion for food (everyone I know from Louisiana is a food fanatic), and his previous positions at highly-respected kitchens in Boston and Portland made him seem like a very natural fit for an upscale Pacific Northwest restaurant like bin. However, I quickly realized that behind the mandatory Ranch Name + Organic + Popular Cut Served with Locally Grown Seasonal Vegetable (which was delicious, by the way) this chef was secretly channeling his deepest inner geek. Take, for example, the dinner menu’s only pasta course: Corzetti. Rather than opt for the more predictable handmade ravioli (which are to Seattle menus as Subarus are to Seattle streets), he chose a fresh pasta that I’d never seen on a menu before. I was intrigued. 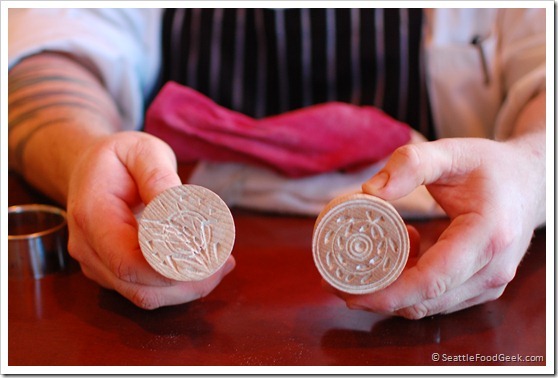 The chef came to the table holding a pair of round wooden blocks and explained that they were handmade stamps for the little discs of pasta he served. Not only does stamping the pasta create more surface area for it to hold sauce (winning geek points already), but these corzetti stamps are only made by a few people in the world and required a trip to Italy just to obtain. Exclusive, nice. Click through for more, plus photos of dinner. After dinner, my dining companion and I followed the chef back to the kitchen, which he had inherited from the Yarrow Bay Grill, the previous restaurant at that location. Poking around revealed standard kitchen stuff: hotel pans of prepped ingredients, stacks of dishware, boxes of Lucky Charms (presumably for late-night snacking), and a busy line of cooks firing out dishes in rapid succession. However, towards the back of the spice rack, I caught a glimpse of a mason jar labeled “sodium alginate”. Then, hiding in plain sight, I noticed a dozen more jars: xanthan gum, calcium citrate, tapioca maltodextrin… all the telltale signs of modernist cooking. Chef Paul explained that these were leftovers from his previous gig, where he dabbled some in post-nouveau techniques. He brought them into the kitchen so some of his cooks could play around, but nothing had made it to the menu quite yet. I smiled and told him I hope something will, one day. And just then, like an old friend quoting Star Trek, we had developed a kindred connection. Chef Paul was a secret food geek. Below are some shots of the dishes he sent out. In addition, the restaurant boasts a list of 70+ wines by the glass, made possible by an argon-sealed wine cellar that prevents spoilage – the same technology that keeps the US Constitution preserved (except from the Tea Party). My geek points runneth over. And now, the dinner gallery. 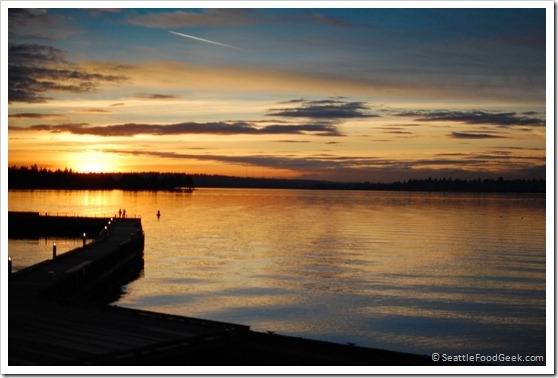 Perched over the water at Carillon Point, bin on the lake certainly has a lovely view of the sunset. 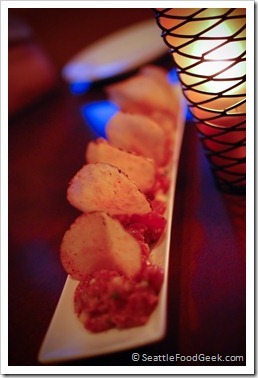 Ahi Tuna Tartare with White Soy Togarashi Housemade Potato Chips. I found the chips to be a little too brittle to support a scoop full of tartare, but the dish was well-flavored fork fare. 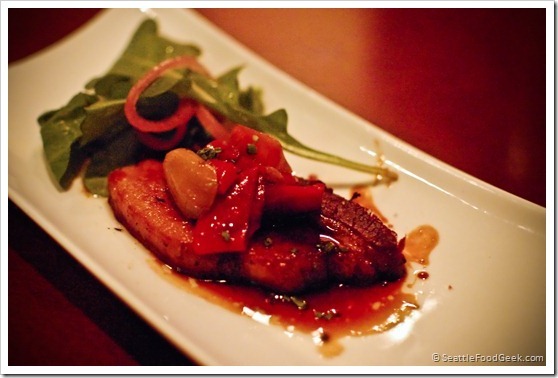 A delightfully smoky pressed, glazed slab of pork belly. The maple-like sweetness was very well balanced with acid from the salad of peppers, pickled shallots and greens. 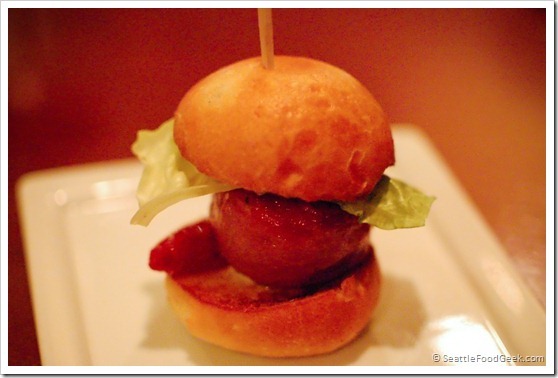 A very playful slider of Maine diver scallop, prosciutto, lettuce and tomato. A delicious and welcome alternative to sliders I’ve seen elsewhere everywhere. 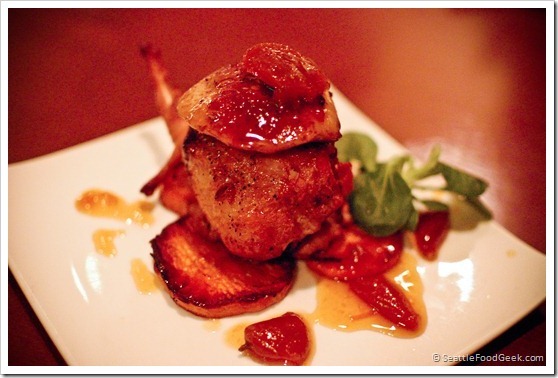 An off-menu special worth requesting: house-made chorizo-stuffed quail topped with seared foie gras and apricot compote. I found that the chorizo and quail together were fantastic, but the intense spices overpowered the foie. The remedy? Eat the quail first, and save the foie for your “dessert” – the upscale equivalent of saving all the marshmallows in your cereal until last. 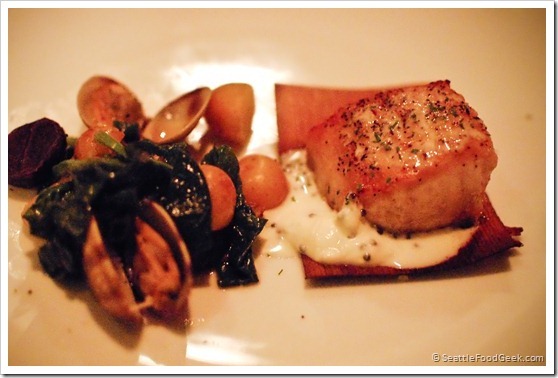 Cedar sheet roasted sturgeon with clams, spinach, crème fraiche and caviar. The whole dish was Pacific Northwest in-a-bowl, but the real star was the spinach. It soaked up the fresh, briny flavor of the clams and tasted like an earthy version of the sea. 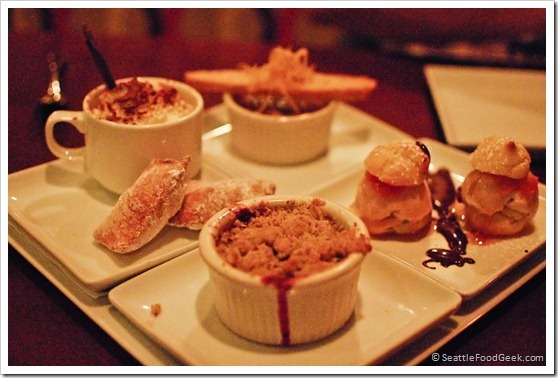 A sampling of the dessert offerings. Of particular note: the peanut butter ice cream in the chocolate P B & J cream puffs took me back to a childhood jar of Jif, and the sweet cream espresso pot de crème was an especially-welcomed lighter dessert. Unfortunately (and surprisingly, given the chef’s heritage) I found the beignets to be a little dense. Sage Brown Butter, Almonds, Ricotta.